A Tahoe Icemen player works for a shot in front of th enet earlier this season. The Tahoe Icemen were oh so close to beating the Idaho IceCats in October on the road in their first matchup with the Northwest Division leaders. The Icemen scored first and went goal-for-goal with the IceCats before giving up the go-ahead goal with just 6 seconds to play. Tahoe was never able to create the same momentum as they had in the first game, and the IceCats dominated the rest of the weekend. 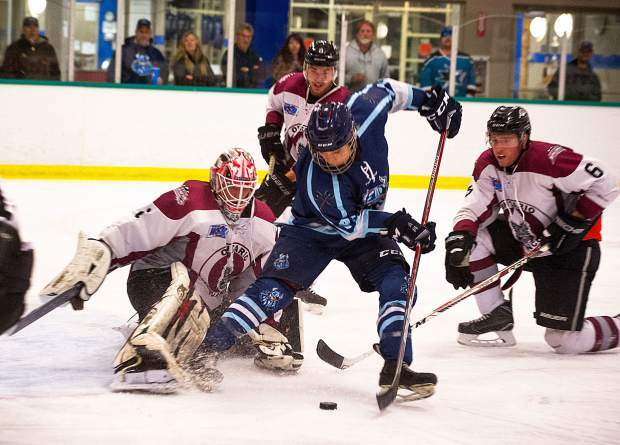 The Icemen get another chance Thursday through Saturday, Dec. 14-16, at their home rink, South Lake Tahoe Ice Arena. Head coach Mickey Lang is eager to see how his team does as the Icemen approach the halfway point in the season. Tahoe needs a win if they want to head into the new year with a firm grip on second place in the Northwest Division. After a win this last weekend, the third place West Sound Warriors have moved up into a second-place tie with the Icemen. Without at least one point, Tahoe won’t be able to push West Sound into third place until their next series in January. The Idaho IceCats (formerly the Idaho Jr. Steelheads) head to Lake Tahoe with a 7-2-0 away record and 38 points in a mere 21 games. They suffered their first defeat of the season against the Ogden Mustangs earlier this month. They have a nine-point lead on the Icemen, and sit comfortably in the top spot of the division. The IceCats have 133 goals for and only 34 goals against and boast a 28 percent success rate on the power play. They have a middle-of-the-pack 409 minutes in penalties this season. Even if the Icemen can draw Idaho into penalties, with a phenomenal 92 percent success rate on the penalty kill, it’s going to be an uphill battle. The Icemen have an 8-2-2 record at home with 29 points in 27 games. They have been up and down this season, trying to work around injuries, illness and suspensions. Tahoe has a 24 percent success rate on the power play. Justin Poirier returns to the lineup after recovering from a game-related injury earlier in the season, and there are no suspensions. Two weeks ago, the Icemen were so short-handed that two of their goalies skated as regular position players. That’s not likely to happen this week. “Not this time, but it just goes to show how dedicated our goalies are to our team’s success,” Lang said. The Icemen sit second in the league with 774 minutes in penalties, with an 81 percent success rate on the penalty kill. Tahoe needs to stay out of the box. The Icemen tend to be strong in scoring and have 118 goals on the season, including nine goals against the IceCats in their previous match-up. The only team to score more against Idaho this season was Ogden. The Icemen have given up 117 goals. Idaho has three goalies and all have a 91 percent or better save percentage. The Icemen have three goalies, Wade Conlan who has a .912 save percentage in 19 games; Tommy Spero has a .909 save percentage in 18 games and Maximilian Haselbacher has a .886 save percentage and one assist in 13 games. Idaho: Forward Lance Herning has 39 points in 19 games and is on a two-game point streak, with two points in his last two games. Defenseman Tristan Phillips leads the IceCats in penalties with 58 minutes in 13 games. Tahoe: Forward Paul Frys has 52 points in 27 games and is on a six-game point streak, scoring 15 points (8 goals and 7 assists) during that span. Easton Easterson leads his team with 102 penalty minutes in 12 games this season. In the last series, the IceCats out shot the Icemen 102-51.